LIHUE » Products crafted on Kauai by the island's people using Kauai materials now have their own distinctive logo: a purple and green mark saying "Kauai Made." The county developed the label to exploit the fact more than 80 percent of visitors to the island shop specifically for Kauai products. Studies show the average tourist spends $150 dollars a day shopping, creating a potential $19 million industry for Kauai-based retailers and vendors. "We wanted to take advantage of this and make sure that it goes into the hands of local business," said Beth Tokioka, director of Kauai's Office of Economic Development. The logo, which features a pair of hands holding a package wrapped in a ti leaf, is designed to symbolize a hookupu, or an offering of an honored gift in traditional Hawaiian custom. Tokioka spent the last three years meeting with local businesses, consulting with advertising agencies and working with city officials to craft a branding campaign for Kauai Made. She said the process was challenging but that the end result is rewarding. "It feels so good to see local vendors and retailers so excited," she said. "I haven't got a lot of sleep the past two months, but it's more than worth it." Starr Seigle Communications, a Honolulu-based advertising firm, played a major role, crafting both the Kauai Made logo and the accompanying branding campaign. "We wanted to create a strong public image to raise visitor awareness of Kauai products and to push visitors to the point of purchase," said Melissa McFerrin, a Starr Seigle representative. The branding effort follows similar programs promoting "Made in Hawaii" and "Made in Maui" products. Nearly 90 retailers and vendors paid a $50 annual membership fee to join the Kauai Made program. They must also adhere to certain rules to maintain brand consistency. Vendors and retailers say it is worth the money and effort. "We think Kauai Made is great," said Lori Cardenas, co-owner of Aunty Lilikoi Passion Fruit Products. "We're really excited about the whole thing." Aunty Lilikoi's Wasabi Mustard was the Grand Champion at the 2005 Napa Valley Mustard Festival, beating out more than 300 other mustards, Cardenas said. Tokioka said Aunty Lilikoi represents the type of creative, high-quality product that makes Kauai Made special. Other members include Kauai Coffee, Hanalei Taro & Juice Co., Kauai Kookies and Risa's Rainbow jewelry. 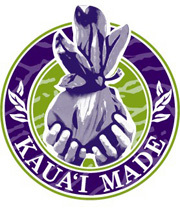 Participating vendors and retailers are featured on the Kauai Made Web site, www.kauaimade.net. Gov. Linda Lingle, who appeared at Friday's launching ceremony at the ResortQuest Kauai Beach Hotel, thanked city officials for their hard work. "I'm impressed by the quality of the products that are being produced," Lingle said.